Not only were materials weak, but anything to do with global growth such as infrastructure hit a wall today even with the market up .5%. Oddly utilities and consumer discretionary had a strong day. FirstEnergy (FE) in the Net Payout Yields (NPY) model closed right at the 52 week highs hit in mid May. Amazon (AMZN) soared 5.5% after closing at a new 52 week high yesterday. It has now bounced from below $180 in mid August to nearly $240 now. Global growth stocks such as materials, infrastructure, and emerging market stocks were very weak today. 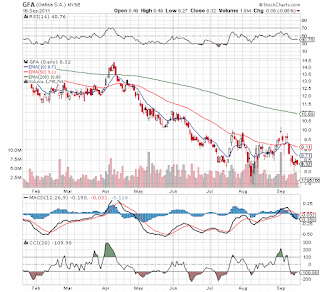 Coal, copper, and crane stocks were smashed even with global markets up. What is this telling us? Maybe that global destruction is off the table, but global growth is still a concern. Investors appear headed for high dividend paying stocks as the NPY model was up nearly 1% while the Opportunistic model stocks were relatively flat. Have treasuries finally hit bottom now that a Lehman type collapse for Greece appears off the table? Sure better to get a 4% dividend than a 2% ten year that might lose value. Most of the global growth stocks have bottomed out, but many haven't soared off the bottom like AMZN, Ralph Lauren (RL) or even Apple (AAPL) that is headed to a 52 week high as well. 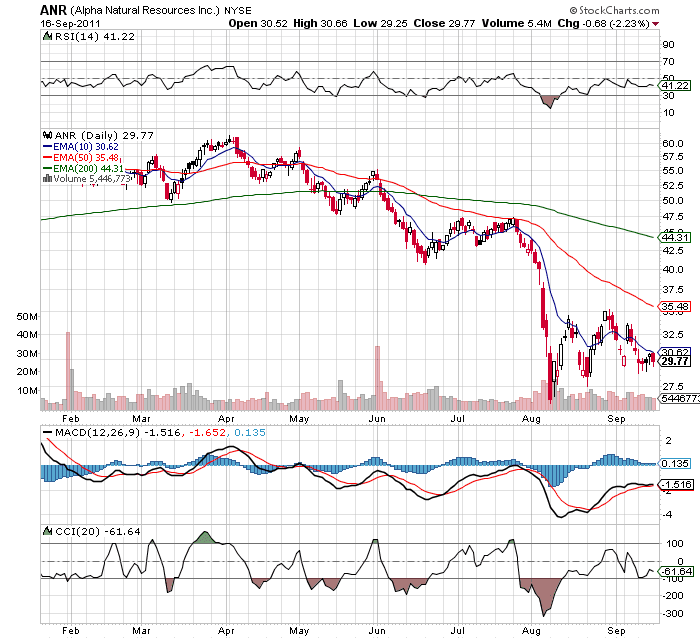 Below are charts of some of our favorite global growth stocks. 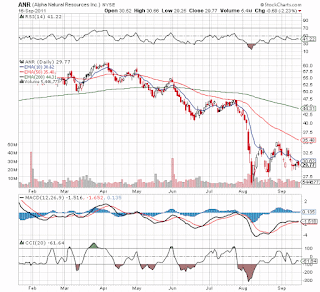 Alpha Natural Resources (ANR) a top 3 met coal company is making higher lows, but the stock was very weak this last week. Considering the stock is trading just below $30 from a high around $68 back in February the upside potential is very attractive. 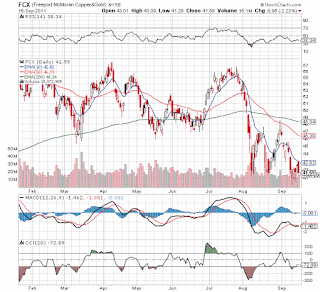 Freeport McMoRan Copper (FCX) a leading copper producer hit new lows this week and failed to rally even with a market up 5 straight days. 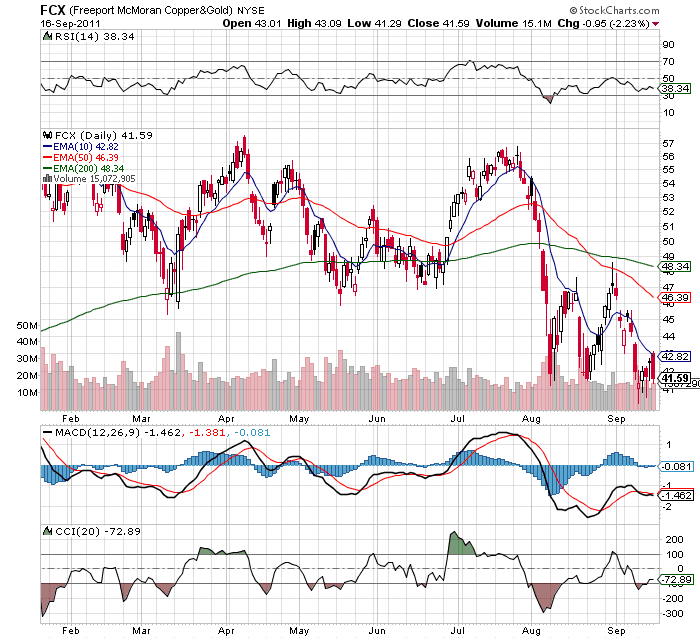 FCX faces particular strike issues at a few mines. The biggest concern is what happens when the market sells off. 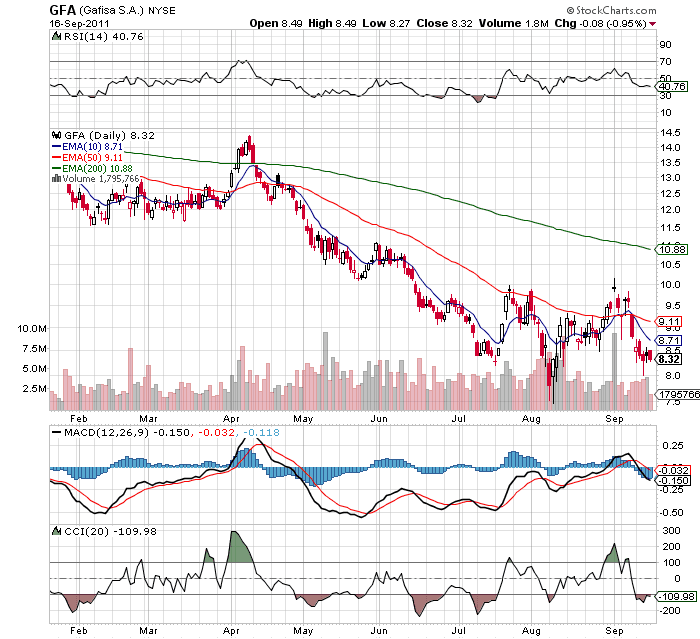 Gafisa (GFA) is a Brazilian homebuilder that was under immense pressure from higher inflation in Brazil and rising rates. 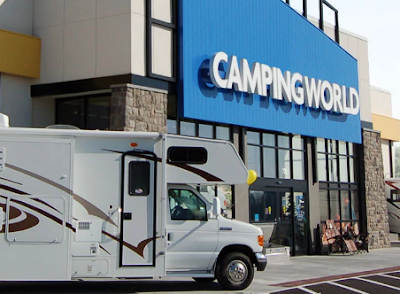 The stock made an attempt to rally a few weeks back after Brazil lowered interest rates. The stock was actually down this week, but it formed an inverse Head & Shoulders pattern that could signal a breakout if it holds this level early next week. Didn't show the crane stocks but Manitowoc (MTW) and Terex (TEX) plunged this week. Not being able to hold the 10ema is very concerning though MTW has still held the early August lows. All of these stocks depend to a major extent on the growth in China. 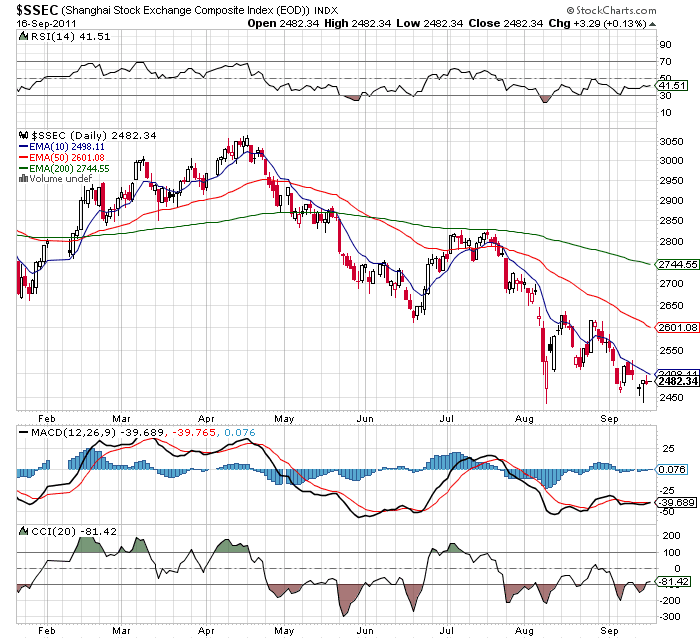 The Chinese stock market has been horrible this year and hasn't rallied like the US. Note how the Shanghai Stock Exchange was down this week and only up .13% today. Apparently the above stocks are following the lead of China. Whether China bounces Monday morning might be the key to these stocks next week rather than the US market. Disclosure: Long AAPL, ANR, FCX, GFA, MTW, TEX. Please review the disclaimer page for more details. Meant to point out that the materials sector is facing the same supply/demand equation where supplies aren't growing fast enough to keep up with BRIC demand. 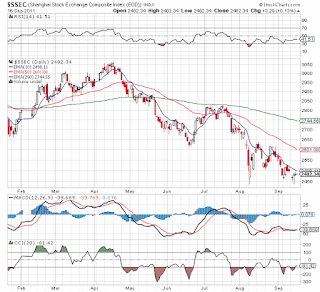 Watching the China stock market will be key. It is due for a major rally.